For sexual diploid organisms, the beginning of a new life is marked with the fusion of two haploid gametes (egg and sperm) from the parents. After fertilization, thousands of genes are turned on and off in harmony with exact timing and spacing, presenting a remarkable symphony of embryonic development. In animals, the zygotic genome is not expressed at first. Instead, the early stage of this process (e.g. the establishment of anterior-posterior and dorsal-ventral coordinates) is controlled by mRNA and proteins deposited in the egg cell by the mother, known as the maternal effect. By analogy, we would expect plants to follow the same rule and exhibit a comparable maternal controlled period before the activation of zygotic genome. This is indeed the current prevailing model for plant embryogenesis, according to which the maternal-to-zygotic transition should not happen until the globular stages (when the embryo has ~32 to >100 cells). Mixed evidences have been found for this model. A most noteworthy support for this model came from a recent study revealing that maternal genome contributed ~80% of the mRNA products in the early Arabidopsis embryo. In contrast, in the study we will discuss today, the authors (Nodine and Bartel) adopted a similar genomic strategy yet showed an opposite result. There are three possible sources for embryonic transcripts: maternal genome, paternal genome and the zygotic genome. An ideal way to solve the controversy will be identifying transcripts from different sources and compare their quantities directly. The authors realized this conceptual design by taking advantage of the genetically well-characterized Arabidopsis thaliana ecotypes and the powerful next-generation sequencing technology. Reciprocal crosses between two polymorphic Arabidopsis ecotypes, Col-0 and Cvi-0, were conducted and the poly(A)+ RNA of hybrid embryos with different developmental stages (1 or 2 cells, 8 cells, ~32 cells) were sequenced by RNA-seq. Since the polymorphic sites between Col-0 and Cvi-0 are known, they can be used as makers to differentiate the contribution from the maternal side (inherited maternal mRNA and half of the zygotic mRNA) with that from the paternal side (inherited paternal mRNA and half of the zygotic mRNA). A 1:1 ratio of transcripts from these two side will support a dominant gene expression of the zygotic genome and/or equally inherited parental mRNA, whereas deviated ratios imply the presence of maternal/paternal effect. 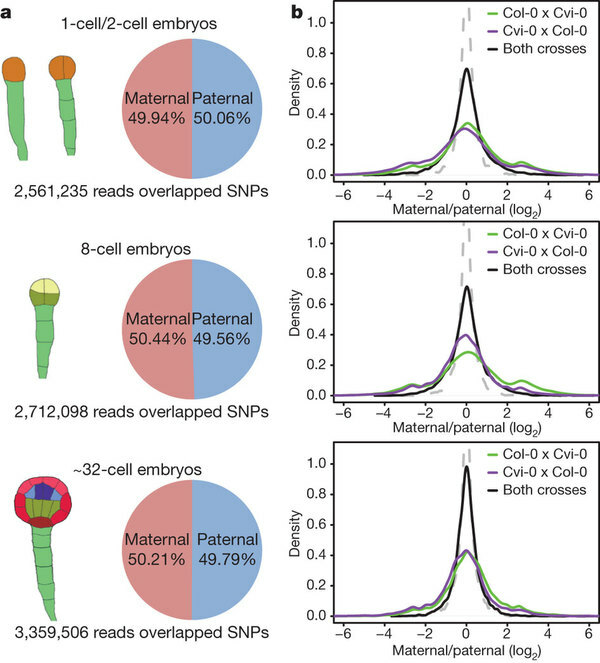 The authors examined their RNA-seq reads and found approximately equal representations of reads derived maternally and paternally in both reciprocal crosses across all three sampled developmental stages. As for those small sets of transcripts showing biased representation, a further scrutiny of their expression profiles between the reciprocal crosses showed bias in the opposite direction. Therefore, such bias should be resulted from genotypic rather than parental preferential expressions. By considering both crosses together, this observation suggests that either near-equal amounts of parental transcripts were inherited into the zygotes or the zygotic genome is activated from the very early stage of plant embryogenesis. Suppose the maternal-derived transcripts can be inherited with the egg cytoplasm, no clear mechanism can account for the comparable amount of paternal-derived transcripts if they were inherited from sperm cell. Moreover, a >4 fold increase of the amounts of many transcripts in the 8 cells stage than the 1 or 2 cell stage was observed. Also, 1138 transcripts among the top 50% most abundant RNA products in the 1 or 2 cell stage showed no detectable expression in both egg and sperm cells by the Chip assay. Lastly, a high level of RNA polymerase II transcription was observed in the early embryos. Taken together, these evidences support the latter hypothesis: an early activation of zygotic genome transcription no latter than the 1 or 2 cells stage. In addition, the authors did another experiment by using GFP reporter with LhG4/pOp transactivation system to detect the timing of zygotic transcription in vivo. The results of this experiment further confirmed the early active zygotic transcription hypothesis. Therefore, according to this study, the nearly equal contribution of transcripts in the early Arabidopsis embryonic development should mainly come from the early activation of zygotic genomes. The current prevailing model about plant embryonic genesis needs to be revised. You might say:”Wait a minute, you have mentioned that a recent study using the similar approaches confirmed that model by showing substantial maternal effect in Arabidopsis!”. That’s right. The authors of this paper also examined the contrasting results generated by these two studies. Two explanations were provided with regard to this point. First, there is no reciprocal cross design in that study, thus the parent-of-origin effect cannot be distinguished from the genotypic effect as in this study. Second, the data from the pilot project of this study suggests that the embryo RNA samples can be easily contaminated by the seed-coat mRNA which is of maternal origin, thus misleading the downstream analysis. From the perspective of plant biology, an immediate question will be whether such equal parenting policy in Arabidopsis represents a common theme in all plants, or at least all seed plants. Paralleled study in more plant species from diverse lineages will be appreciated. Putting this result in an even broader context, we would like to ask why plants and animals have chosen such different developmental strategies in terms of their early embryogenesis. What’s the role of maternal effect in plant embryonic development and what mechanisms enable plants to complete their maternal-to-zygotic transition so quickly? Also, this study once again showed the unprecedented power of next-generation sequencing technology in current biological research. Lots of long-standing questions can be now readily solved by using this new approach. The technology available is not the main limiting factor anymore; it is more likely to be our imagination. MD Nodine, DP Bartel. 2012. Maternal and paternal genomes contribute equally to the transcriptome of early plant embryos. Nature. 482: 94–97. doi:10.1038/nature10756.